'Paper Girls' are back and as entertaining and frustrating as ever. The charming retro alien invasion story from Brian K. Vaughan and Cliff Chiang is back for another arc in issue six. Erin, Tiffany, and Mac were last seen coming across an all-too familiar face- an adult Erin. While the series has been an enjoyable flashback to the 80s it's been short on details and explanations for what's going on. Finding themselves in the present day with only Adult Erin to help them, the girls are adorably fascinated by modern tech - smartphones, flat screen TVs - as they try to figure out what to do next and find their other friends. The bulk of the issue deals with Adult Erin trying to get her head around her time traveling younger self but doesn't share her memories. It's a familiar storyline but it's irresistibly charming and fun nonetheless. The story only progresses slightly again not offering a lot of explanations for their current predicament. 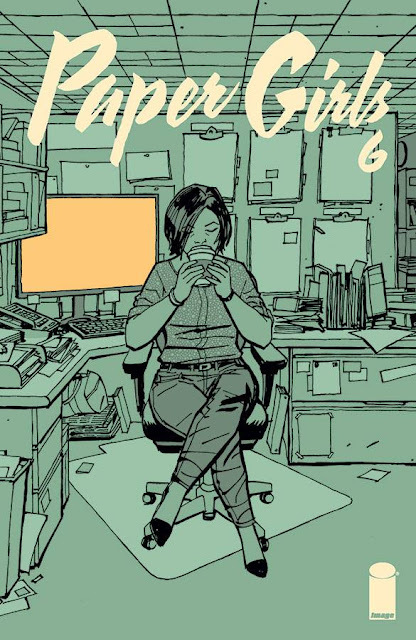 As great as Vaughan is, 'Paper Girls' feels like he's making it up month to month. The characters are great- funny, smart, and determined - but could use more development and more direction. This is nit-picking, I know, it's still a good read and with Vaughan, Chiang, and Matt Wilson as the creatives 'Paper Girls' is still better than most books. Chiang and Wilson (with some help from Dee Cunniffe) continue to produce a gorgeous comic. The layouts and character designs are masterful and if there was one criticism it would be the monochromatic colors that sometimes washes out scenes, giving it a dimly lit appearance in purples, blues and yellows. 'Paper Girls' is back and I want answers! Unfortunately, the mystery only deepens as the girls are thrust through space and time leading to more unanswered questions. Yet, this new arc is irresistibly engaging and funny. It might work better as a trade but you can't go wrong with Vaughan, Chiang, and Wilson on a title.